I’ve been really, really bad about updating the site while I’ve been on my trip, and I feel horrible about it! I had all these grand plans to be covering things as I experienced them, but unfortunately I’ve been so busy that I’ve only had the energy to do quick Twitter and Instagram updates as I go along, for the most part. But to keep you all from thinking the site is dead, here’s a very overdue Catch-Up Corner to get you up to speed with some of the things I’ve been doing! 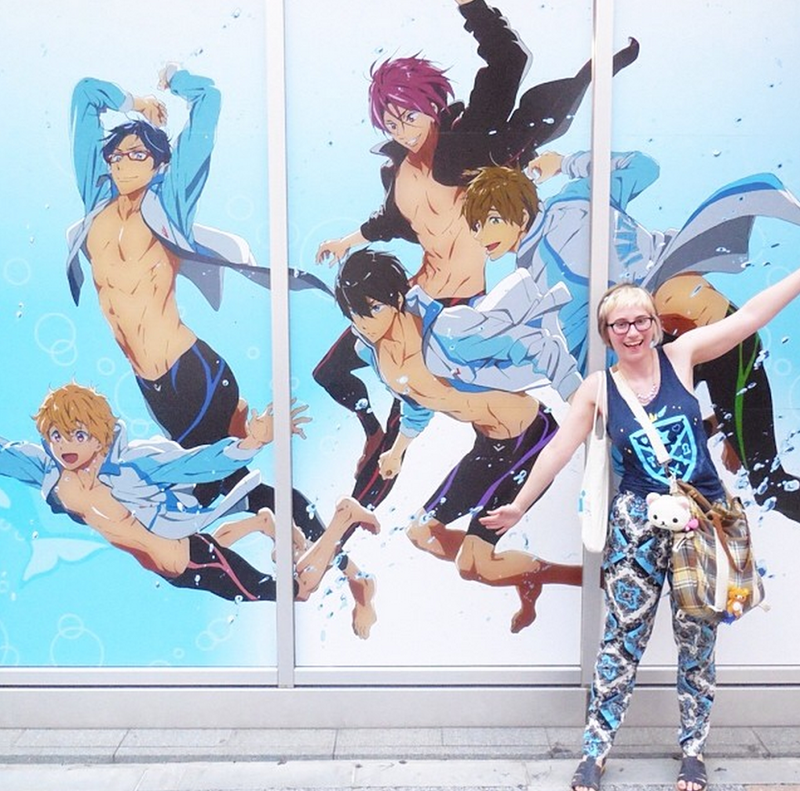 Me with this awesome Free! mural in Akihabara! First of all, if you’re still not following me on Twitter, Instagram, or Facebook and want to keep to date with everything I’m experiencing in Japan as it happens, please consider doing so! While I’ll do more long-form coverage of some of the more standout things I’ve done over the course of the past couple of weeks once I get home in a few days, there will still be some photos/information on my social media that you probably won’t see here on the main site. While I was initially considering doing some out-and-about video coverage, I’ve found that I’m just too shy to film most things… Luckily, I’ve been able to take a few short videos, and have posted a couple of things I filmed from my University of Tokyo dorm. The video above is an unboxing of a Gatchaman Crowds rubber strap blind box. I was so excited to find some Gatchaman Crowds merchandise! If you only have the time/tolerance to watch one video of me today, though, make it this one – it’s an Apricotsushi Samples straight from Japan! Better yet, it’s of some random “hangover remedy” drink I was handed in the streets of Tokyo, so you’ll get to hear me talk about that whole experience, too. 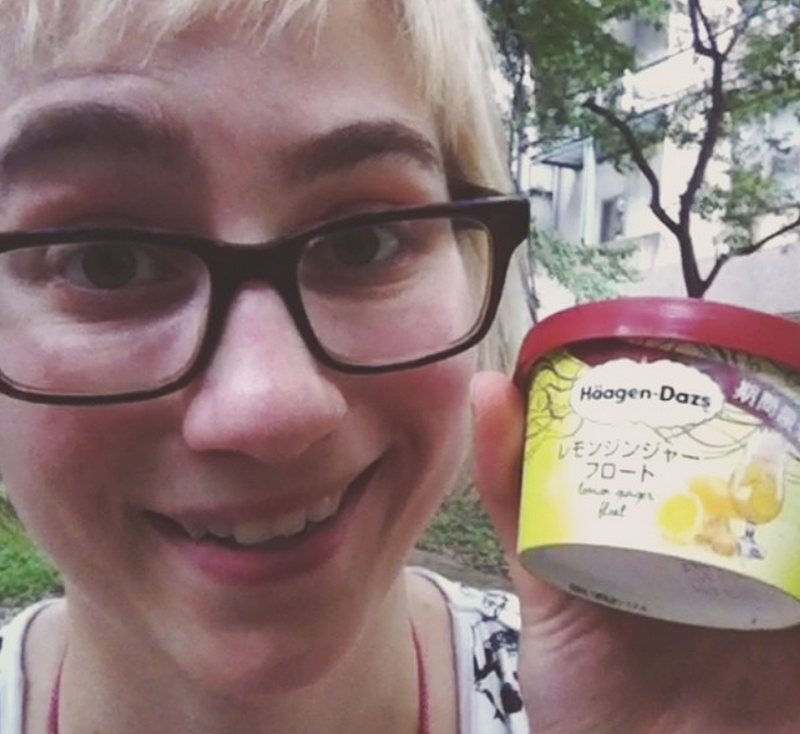 Finally, I did a very short impromptu Apricotsushi Samples video of me trying lemon ginger foat ice cream on my Instagram, since it was too hot to carry it home to film properly. The video is available in two separate parts, so be sure to watch both! I suppose you also get to experience some of the summer Tokyo atmosphere – namely, cicadas and my sweaty face. Well, there’s a whole slew of video content that will hopefully keep you busy for a little while, if you haven’t seen them already! I’ve got many more Apricotsushi Samples on the way, including posts about my various experiences, such as the Square Enix and Rilakkuma cafés. Sorry for the wait, but I hope you’ll look forward to them!